When you are going to give a stage performance as an old lady or old man, makeup is a very important consideration at all. The old man makeup is somewhat difficult if you don’t know the appropriate steps and makeup kits. The following is definitely the extraordinary guide to make an old getup or makeup in a perfect manner. 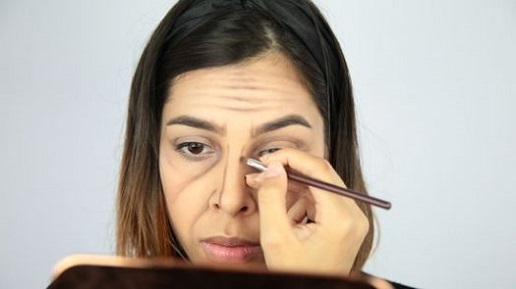 With the help of the brown eyeliner, you can draw wrinkles on face to get real old getup. You can either buy all these ingredients separately from the market or you can also get them in the form of a kit. Nowadays, there are a lot of beauty brands providing the specialized kits with the combination of a variety of makeup items to create the old man or old lady get up. Instead of the full kit, there is also the availability of the smaller personal kit if you are going to use only one time. While creating the old lady makeup, you should start with the clean and fresh face and following these steps suggested by the experts. First, you have to apply the best brand foundation cream throughout the face. It will create a very good base for your old age makeup. When your face is oily or contains more moisture, it is better to put the best primer first on the face. You should start from the top of the face to the bottom this is because it is very easier to do the old makeup in this way. Forehead – Raise your eyebrows to wrinkle your forehead up and draw the flat line. Eyes – First highly the eyelid and eyebrow bones down to the outer corner. Nose – You can start at wrinkle to the nose tip. Cheeks – Shade the natural crease and blend outwards in the cheeks and extend the shadow down to your mouth. Lips – Cover your lips with highlight. Jaw – You have to add highlight to the scallop motion beside your jawline. 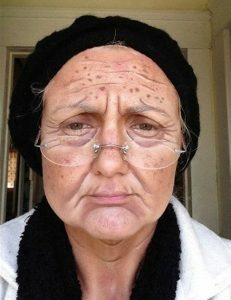 Finally, you can have the real old lady or old man getup perfectly once you have done all these steps using a makeup kit.